In this world of portable digitization, mobiles are fast becoming a way of life. Development of mobile applications requires innovative conceptualization and the highest levels of technological expertise. At Multidots, we encapsulate your vision and business strategies into applications which are best suited for your customer needs and requirements. We at Multidots combine the latest features of mobile technology, system integration and methods of engagement—to add long term value to your business processes and deliver innovative solutions to place you ahead of your competition. CNI Solution is one of the earliest mobile application development company from India that started making Android, Windows and iOS apps. We have always provided best in class service in mobile app development outsourcing services till date. When you choose CNI Solution, you are partnering with most cost-effective team that has been designing and developing feature-rich mobile apps for years. 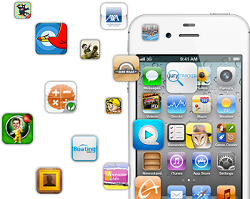 CNI Solution hires the most intelligent, proficient and tech-savvy mobile apps developers. Our developers have in-depth knowledge of major platforms or frameworks used for mobile app development. With a team of over 20 dedicated developers, designers, and creative engineers, we can provide on-demand capacity to help you meet challenges, tight deadlines and promises to the marketplace.